Whenever you want to buy a term insurance policy you make a comparison of features, premium, and riders and purchase the policy. Do you ever try to negotiate term insurance premium rate? The answer is NO, Why? Because term insurance premium is fixed based on your age. 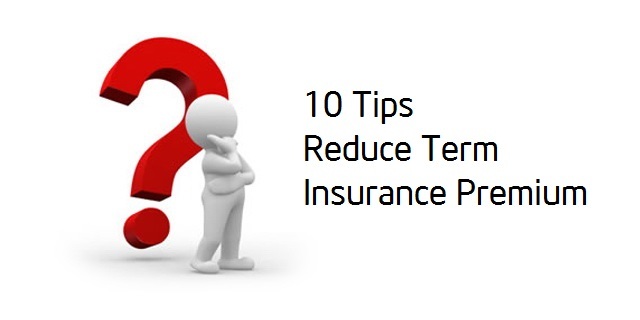 However, it is possible to reduce term insurance premium if you follow the tips given below. In order to reduce premium of your term insurance policy make sure to purchase insurance over at a young age. Your insurance premium depends on your age. At lower age insurance premium is low. So, purchase term insurance plan as soon as you got your first job. The second method to reduce term insurance premium is to go for an annual mode of payment. It is generally seen that people prefer monthly or quarterly premium payment when it comes to insurance. However, if you want to reduce premium of your term insurance policy you should go for an annual mode of payment. The tenure of policy also affects your premium. If you want to reduce term insurance premium you can go for a longer term of the policy. Longer policy term means lower premium rate. The next method for reducing term insurance premium is by avoiding unwanted riders. Term insurance comes with multiple riders such as accidental death rider, critical illness, premium waiver etc. Additional riders come with an additional cost so you can remove unwanted riders from your policy and reduce the premium amount. You should stay healthy and live a healthy lifestyle. Your health plays a major role in deciding term insurance premium. You must be aware that you need to undergo a medical check for high-value term insurance policy. Any detection of abnormality in your health will lead to increase in insurance premium. In continuation with above point of staying healthy, you should avoid tobacco. Whenever you buy term insurance you need to declare that you are tobacco user or not. If you are tobacco user your term insurance premium will be high. Alcohol drinking habit will also impact adversely on your insurance premium. If you are regular alcohol drinker your term insurance premium will be high as risk is high. So, avoid alcohol. The next point to reduce your insurance premium is a mode of purchase. Offline mode cost you more money as you will be paying an additional cost of agent’s commission, documentation, and other charges. So, if you really want to reduce your term insurance premium go for online mode of purchase. You might not be knowing that type of job also affects your insurance premium. If you are doing a job which is risky in nature your term insurance premium is likely to be high. So, it is advisable to select a nonrisky job. Your current medical condition also affects term insurance policy premium. If you are detected with a disease like diabetes, hypertension or heart attack your term insurance policy premium will be high. So, make sure to stay fit and cure these diseases. I hope tips mentioned above will help you in reducing your insurance payment. If you know any other way to reduce premium do share it in the comment section given below.